"With my new RIMS® mounts in place, every drum sings like never before. that it's hard to suppress a smile when I hit them." 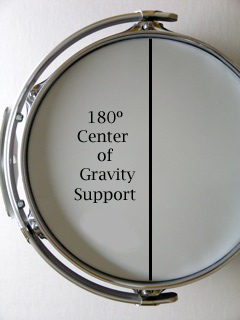 The basic principle of R.I.M.S.® is that the drum is held at two points dividing the center of gravity in half. This takes all stress off the drum shell and distributes the vertical weight evenly when suspended. To test the common sense of this idea, pick up a drum with your hands. To hold it upright, you naturally place your hands at points 180º apart. Picking it up with your hands at only one point and trying to raise the drum to a playable angle is almost impossible since the drum is off its center of gravity. The lopsided weight is making the drum heavier to hold upright creating a twisting torque on the shell. Even if you can hold it up this way, imagine someone now hitting it with a drumstick. The stress on the drum is enormous, and when mounted this way, can very easily cause shell warping issues, especially in high humidity. Most mounts that have been developed since R.I.M.S.® do not take into account this extremely important element of basic physics. "I just wanted to let you know how happy I am with your RIMS® on my Mapex toms. I've been using your product since 1979. ​Rogers, Gretsch and now Mapex. Success rate 100%." Each R.I.M.S.® mount is rolled by hand and checked to make sure the diameter is perfect. 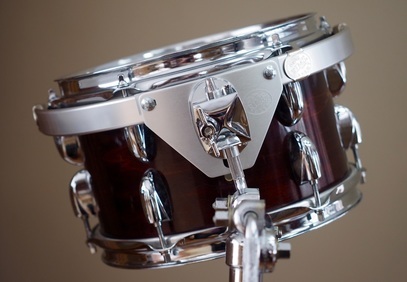 It is vital that a RIMS® mount fits the drum just right, thus eliminating any lateral forces on the drum when mounted. Mass produced copies or 'R.I.M.S.® style' mounts that are on the market are not rolled to the exact diameter of the drum, resulting in more inward or outward stress on the tension rods, lugs, and shell of the drum. You may see the tension rods literally ripping through the rubber grommets of these mounts because the force is so strong. The result is loss of resonance and a drum shell that can be distorted out of round. "Simply put, the 12 inch drum now sounds astonishing. It not only has more sustain, but is deeper and fuller, and the strange overtones are gone. now sounds choked by comparison to the 12 inch with the R.I.M.S.® mount." When early R.I.M.S.® mounts were first made out of steel, they worked for many drummers. But we would still hear from those who were confused about why certain drums still sounded choked. After doing research, we discovered some amazing things about the properties of the material. When steel is chrome plated, it hardens the material and takes on a tonal pitch. So when it is placed on a drum that is tuned within a certain range, those two pitches react to one another and will cancel each other out, resulting in a drum's tone being choked. Since aluminum works as a better isolator, and we no longer chrome plate the material, there is nothing to work against the drums resonating tones. The added bonus is that aluminum is one third of the weight of steel, so our mounts are the lightest way to achieve the most effective result. "I am very pleased with my new RIMS®. They look and sound fantastic. I can't believe how light they are and still feel solid when played. They have outperformed all other systems I have tried. ​My Luddys never sounded this pure and good before." We created the adjustable flange so that the point where the mount connects to the drum's tension rod can be customized and placed to fit any drum. We found particularly in vintage drums that lugs are not always evenly spaced, so allowing a drummer to align the flanges accurately quickly solved this problem. It is just one more step in creating the perfect fit for every individual drum. "I have tried for years to configure the Optimount system on my kit to no avail. Literally dozens of hours tweaking that produced minute improvements. RIMS® DRASTICALLY improved the overall sound of my kit. The toms sing out like never before. Dramatically improved sustain, resonance and overall body and clarity of sound. I am now FINALLY hearing 100% of the shell. and are sounding 'full spectrum' and fully open for the first time. ​Virtually ZERO over ring as well." We encourage everyone to test various drum mounts to hear how well they work and make sure they are getting the most out of their drums. Simply tune your drum and strike it as it is normally mounted. Then take the drum off the stand and strike the drum while holding it with your thumb and forefinger. If the drum sounds fuller and deeper with more sustain when you hold the drum in your fingers, then your current mount is not isolating and your instrument is not performing to its greatest potential. A drum suspended on a RIMS® mount will provide the same fullness of sound that you hear when your drum is struck off the stand. It should be noted that a drum's natural resonance is affected by many factors before it is ever mounted; such as bearing edges, drum heads, out of roundness, etc. If you strike your drum off the mounting stand and feel it is not resonating fully, it could very well be for one of these reasons. These factors are common in old and new drums alike, and we encourage musicians to listen to their instrument and become aware of the factors that create the sound of their drums.